This entry was posted in Activity News on May 8, 2013 by admin. There is no turning back for Tunisia. Ever since the start of the Jasmine revolution, it has been heading for democracy. Its path, however, will be winding and stony. It will take time for the Tunisian transformation to reach a consolidated democracy. Tunisia needs patience and friends, said Elyes Ghariani. 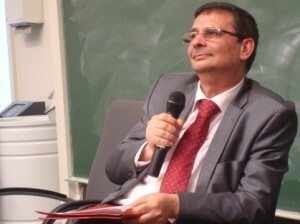 Elyes Ghariani, Ambassador of the Tunisian Republic to Germany, paid a visit to the University of Passau on May 6, 2013. After meetings with members of the DAAD-supported project “Tunisia in Transition”, he gave a keynote address. In front of a lecture hall that was full to burst with hundreds of students and university staff, he retraced the Tunisian revolution from its beginning through to the challenges of today. Mr Ghariani pointed to the international recognition that the Tunisian peaceful revolution has been receiving. He also emphasized Tunisia’s position as a role model for its neighbors who are facing similar challenges and whose revolutions have been ignited by the Tunisian example. He then exposed the challenges Tunisia is facing. The social challenge is mainly posed by fighting unemployment and giving its well educated youth a professional perspective. Especially the cleavage between the fairly rich coastal region and the much less developed “hinterland” is proving to be problematic. Concerning security, the Ambassador addressed the difficult geographical position of Tunisia, located between Mali and Libya. He underlined that Tunisia, having invested more in education than in defense since its independence, is a country with limited military capabilities. Against this backdrop, Mr. Ghariani valued the importance of bilateral and multilateral cooperation for his country. He emphasized the need to build up Tunisian civil society as bulwark against any kind of authoritarianism. According to him, Germany, having experienced the overthrow of an autocratic regime in its Eastern part, is advancing to become Tunisia’s most important partner. The Ambassador’s speech was followed by an intense discussion with the students, which touched upon the role of religion in the Tunisian democracy, women’s rights and the credibility of the West in Tunisia today. Thanking Germany for its commitment in the Tunisian transition, the Ambassador reminded in his final words that “transformation is not a nescafé”. Cooperation in this regard thus needs patience, enduring care and sustainable projects. 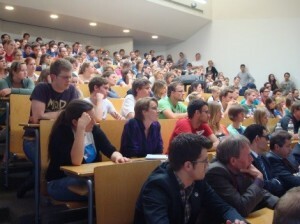 He encouraged the students to get involved, to come to Tunisia and to get in touch with its vibrant youth.